There is so much to be thankful for everyday but today I especially want to give thanks to all of you who take time out of your busy schedules to read my blog. This week Stephie Estie hit 500 followers on WordPress alone and we’re very close to 1k total subscribers! However, no one does anything alone and all of the support and encouragement I receive from you guys keeps me inspired and going. For that, I am immensely grateful so from the bottom of my heart, thank you! Happy Tuesday readers! 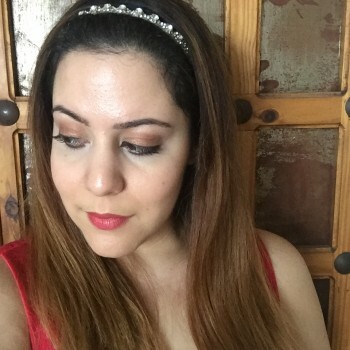 When Tanya from Tanya’s Beauty Diaries invited me to do a holiday makeup collaboration, I was thrilled. 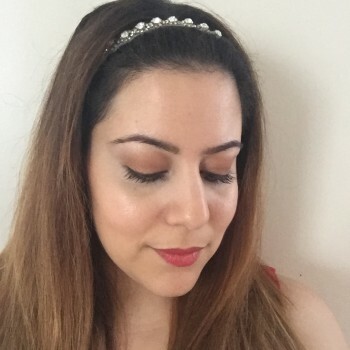 Taking inspiration from the new Tarte Apple of my Eye Eye Shadow Quad and the Marc Jacobs lipstick in Je T’Aime, I decided on pairing glowing skin with a red lip and subtle smokey eye. Directions: Apply Golden Delicious all over the lid and underneath the brows. Use Caramel on the crease and Honeycrisp on the lid. Take a pencil brush and apply Gala to the lower lashline. Eyeliner: MAC Fluidline Eyeliner Gel in Dipdown on the top lashline. 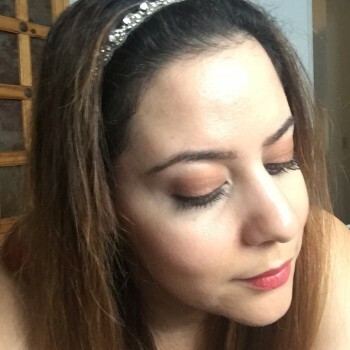 *Note: The hairband I used is Deepa Gurnani Katie Crystal Headband that was featured in this month’s PopSugar Must Have Box. Special thanks to Tanya for having me on board and please don’t forget to check out and follow Tanya for more holiday looks! Skin Tip: How to Store Skincare Products! Make sure you are keeping your skincare products in a cool, dry environment to help preserve their efficacy. Avoid placing them near heat or direct sunlight as this can cause products to break down quicker. 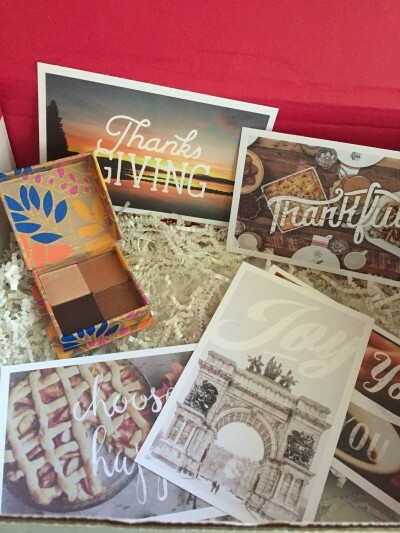 PopSugar Must Have Unboxing November 2015! Hi readers! It’s almost the weekend again. Yay! 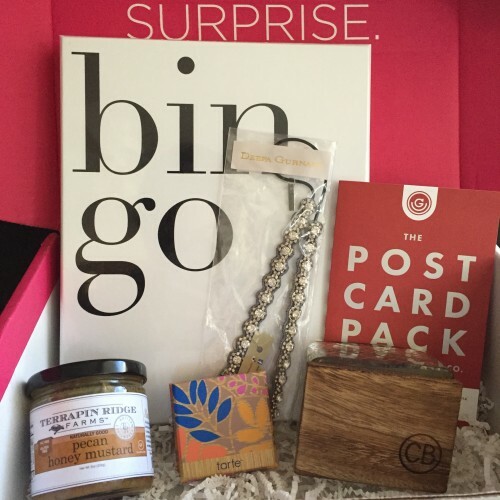 PopSugar Must Have Box also came in last weekend so here’s your peek at November’s box. A cute set of 5 postcards. They included a $15 coupon code to try out their quarterly subscription. 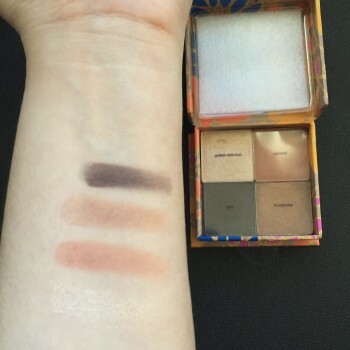 When I first saw we were getting a Tarte eyeshadow quad, I wasn’t too thrilled but after seeing the shades, it’s clearly the star of the box. Perfect fall and everyday colors. This is a new product from Tarte’s fall line that will soon be released. 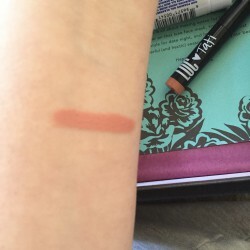 Swatches of the eyeshadow quad. Top-Bottom: Gala, Honeycrisp, Caramel and Golden Delicious. I’m really loving Caramel. Pretty self explanatory. Not sure if I will keep this or gift it away but it’s a good idea for a rainy day. This festive headband seems to be a perfect fit for the holidays coming up. I love candles and this one is no exception. Everything from the packaging, a recycled hand blown glass box with wooden lid, to the scent is lovely. 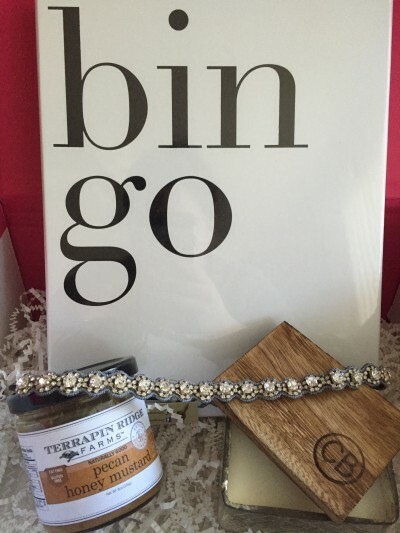 Plus, it can be used as a keepsake box after the candle is finished. I must admit I love honey mustard and was happy to receive this. It’s gluten and dairy free and tastes a little bit like Dijon mustard. I couldn’t taste the pecans really. This can be used as a vegetable glaze, cheese pairing, sauce for pork tenderloin or roast turkey, or pretzel dip. 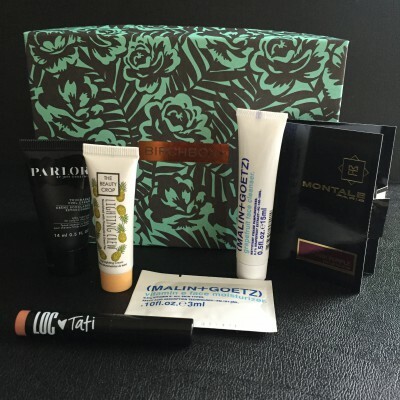 Birchbox came in over the weekend so here’s a glance on what was included. This cleanser is said to help clear up breakouts and balance skins natural pH;the moisturizer has hyaluronic acid and vitamin E to nourish skin. I haven’t had a chance to try these two yet. Birchbox has a new in-house brand called LOC. 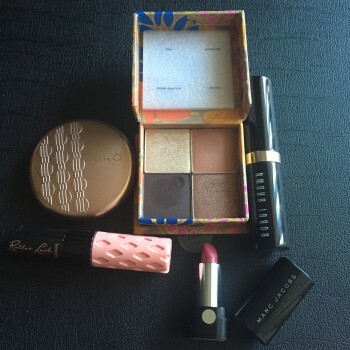 This month’s sample I choose was a lipstick that was curated by YouTube beauty star Tati Westbrook. 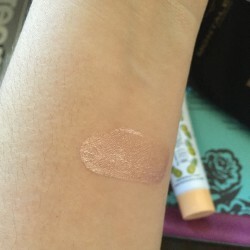 It’s a matte pinky beige color that is so pretty but unfortunately doesn’t last long and definitely needs to be paired with lip balm or lipgloss so it doesn’t dry out lips. This fragrance sample has “notes of rose petals, geranium bourbon, and patchouli [that] sit on a woodsy base of gray amber, teak wood and white musk.” It smells a lot like berries and while I do like it, it’s not unique enough that would compel me to purchase the full size. An “innovative formula [that] combines the siky texture of a serum with the light hold of a cream.” Another item I have yet to try but I do find that I always need to layer hair products with these type of creams to really hold my curls in place and prevent frizz. I had seen this in other bloggers’ pages and I was excited when I discovered this was included. It smells like pineapple, (yum!) and really does add a glow so a little dab will go a long way. It can also be mixed with body lotion to give your body a festive and luminous glow. Note: Make sure to blend this quickly when you use it. Overall, this box was okay. I wish the lipstick was formulated as more moisturizing but the highlighting cream was a great choice and made this box. 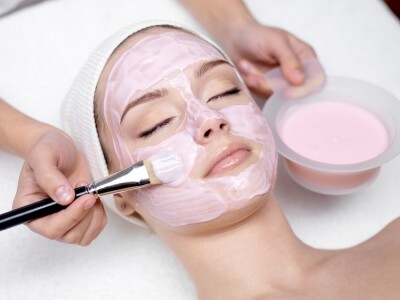 What You Need to Know Before Booking a Facial! With the holidays fast approaching, you may be thinking of booking a facial. Make sure to read this first so you know what to expect! Before receiving a facial, you will be required to fill out a consultation card. This helps determine what treatment will be best, and most importantly safe, to perform. This step should always be incorporated before any treatment. Expect questions asking you about your lifestyle, current product use and medical history and be honest with your answers to avoid any complications. Be mindful that after reviewing your consultation card or skin analysis, your esthetician or medical provider may modify or advise you to post-pone a treatment. 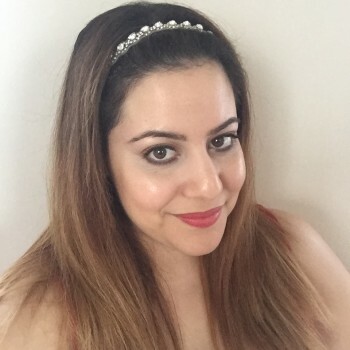 For example, if you’re using prescription Retin-A, a chemical peel will not be performed unless you have discontinued use for a couple of weeks with permission from your doctor. Or, if you have an eczema flare up or an active blister outbreak, expect to immediately be prompted to medical treatment. While facials and chemical peels can produce excellent results, you also need to have realistic expectations. One treatment may not be enough to control your hyperpigmentation or extensive sun damage. Also, maintaining your results is largely contingent on you. If you are advised to avoid sun exposure and heat for a few days or instructed to not pick at your face, take heed! Trust us, you don’t want to aggravate your skin and make a condition worse.